Need to empty out the garage? Looking for a place to store your seasonal decorations? Relocating overseas for a new job or for a temporary assignment? How about storage to make room for skiis, bicycles, memorabilia or opening up an extra bedroom? Federal Heights Storage is here to serve you! We are conveniently located at Federal Blvd. and 92nd Street in North Denver. Our well-lighted facility is excellently maintained with state of the art video security system. Our self-storage consultants will expertly analyze your situation and belongings to identify the best storage options and sizes tailored specifically for you. Our ground level units make transferring your possessions quick and easy and we offer a U-Haul option with move-in. Need packing supplies? At Federal Heights Storage we have a full range of offerings to protect your valuables located right on site to make it easy on you while you tackle the task of moving and protecting your belongings. We have the most competitive rates in the Denver area, including special rates for seniors, veterans and savings for paying in advance. 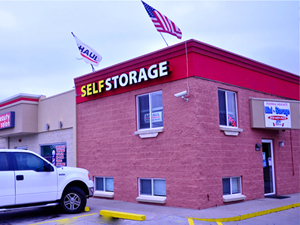 Whether you are looking for short-term storage for an office relocation, an off-site business storage option or just some place for the overflow, Federal Heights Storage has just what you are looking for. Come and see us today!